Gaborone, Botswana: Apart from sustaining a rich diversity of natural ecosystems, the country’s water resources are critical for meeting the basic needs related to water supplies for domestic and industrial requirements, with the wildlife included. Mankind however, has turned out to be his own and the ecosystem’s worst enemy. Mankind is the destroyer of the much needed water resources and in the process destroying many other animal species living in water and on the wetlands. The fauna and flora, the animal, bird and many other all suffer because of the dumping of construction concrete debris, used tires, and plastic and shop issued plastic carrier bags or any other garbage that is not needed. Plastic carrier bags that washed into dams and lakes normally trap fish, frogs and other water living beings, eventually leading to their prematurely death. Efforts to sensitise the general public on the effects of plastic, debris or garbage falls on deaf ears and always regarded as ‘drivel garbage’. Plastic reduces the aesthetic value of the environment as they hang on trees and generally are widespread in the environment. Some bird species are alleged to die from being attached to plastics. The bird normal flies without stopping for the fear of the plastic attached to it, mostly on the legs. The bird then dies of exhaustion after flying without rest; ‘trying to flee from the plastic’ attached to it, the wind blowing against the plastic forces the bird to fly even harder. 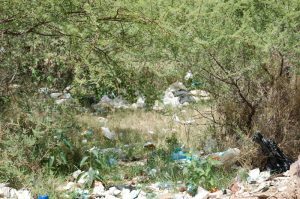 Dumping of concrete debris have changed or altered water ways, the plastic, especially the shop issued plastic bags, besides trapping or snaring the fish and birds are alleged to be hazardous to the ecosystem. Plastic is not biodegradable hence once deposited in the soil it persists in the environment for a long period of time. The plastic have adverse impacts on human and animal health due to their impervious characteristic, they serve as a breeding place for mosquitoes and other vermin. Domestic animals like goats and cattle also feed on plastic and they disrupt the digestive process causing bloating and untimely death of animals. The Botswana Ministry of Environment, Natural Resources Conservation and Tourism has made several attempts to manage or control the proliferation of plastic carrier bags in the environment through various strategies such as public education and awareness on proper use of plastic carrier bags, recycling and minimization of its use. Water stress due to changed or altered water courses and with the aid of climate change has forced the wild animals to come closer to humans in search of water. “Since 2009 to date, 39 people have been killed by elephants. Of this figure, as many as 14 people were killed by elephants since last year (2018), and there has been destruction done to people’s livelihoods, livestock and communal farms,” says the deputy permanent secretary responsible for natural resources in the Botswana Ministry of Environment, Natural Resources Conservation and Tourism, Felix Monggae. In addition, Felix Monggae says the hunting ban has negative effects which ramps up the wild animal population, especially the elephants. He says the Botswana government is spending millions of dollars in compensation for damages caused by the wild animals. “The compensation has shot up from P4 million to P21 million annually. The elephants also move out of their designated range into human settlements, at times being found in cities such as a stray elephant was found in the capital city of Gaborone, at the Phakalane suburb. The rural livelihood is under threat leading to frequent complaints from communities and the state having to spend more funds to address human-wildlife conflict,” says the deputy permanent secretary. However much of the blame is alleged to be on the culling of the elephant population which is said to have reached a magnitude of 130 000 in Botswana out of Africa’s total population of 415 000 elephants. The climate change, alteration or changing of water ways or causes through dumping of waste in form of debris and plastic is alleged to cut some water sources in the wild, leaving only the water sources in human settlements. The elephant is also said to sense any convergence of threat and as a result come close to the human settlement to seek refuge from the poachers and in search the much needed commodity, water. The plastic industry in Botswana is said to employ many people who will be left jobless, the government has put the decision on hold till alternatives are found to create jobs for people in the plastic industry. 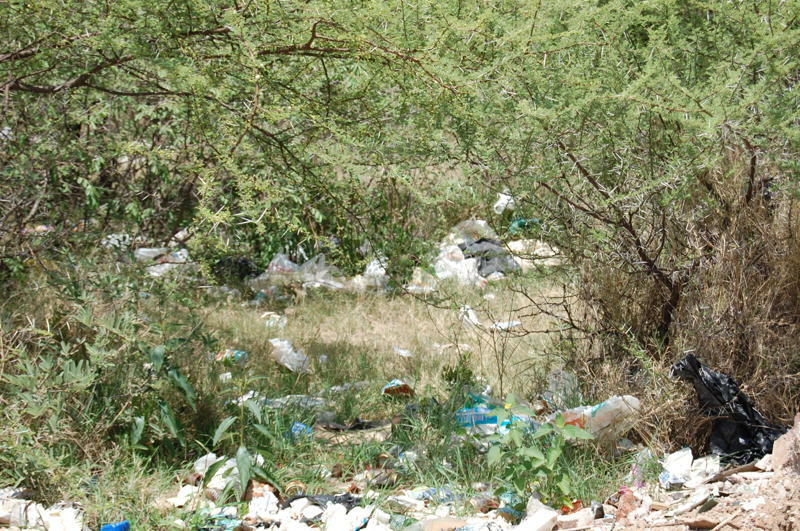 Rwanda and Kenya have already implemented the ban on plastic and Botswana will soon join them and a number of other countries and cities around the world who have shifted towards the ban on the use of plastics as pollution prevention measure. Pollution: Big challenges for delegates attending UNEA conference in Kenya World commits to pollution-free planet at environment summit Climate Change: The challenges of Botswana Comment faire face à la pollution atmosphérique ?